You won’t necessarily have to replace your metal roof when it inevitably springs a few leaks. We have a unique metal roof restoration process that will make your roof look and function like new, while saving you as much as 50% from the cost of replacement. To accomplish this, you’ll need to make sure you hire an experienced metal roof restoration contractor with knowledge of the best materials to use. As an example, every screw and fastener on a metal roof has the potential to be a source of leaks. They have rubber washers that are installed underneath them, who’s function is to keep water out. Water will get into your building, however, as these washers deteriorate over time. Our unique metal roof restoration process protects and restores your metal roof to almost new shape and brings it back to a condition that will protect your property from the elements. We use an advanced high-tensile coating as our main component, following the sealing of all possible leak sources, and set the industry standard for quality, affordable commercial metal roof restoration. It retains color well and is the best choice for protecting your building against severe weather conditions. You’ll find that it has an excellent Energy Star rating and plenty of attractive color options to choose from. You’ll get long term guaranties and warranties to show that we stand solidly behind our work and process. Over time, its inevitable that your metal roof will fail. The roof’s fasteners and seams are usually the two biggest culprits for leaks in metal roofing. The processes and procedures for metal roof repair and metal roof restoration are somewhat the same. The restoration process will make the entire roof waterproofed, whereas repairing will just address the individual areas that are currently leaking. Property managers and building owners that are being careful with their budget might want to choose just repair, as a full blown restoration is more costly, even though it will save a lot of money versus replacement. You can determine which path to take by having all of your roof’s weak points inspected and assessed. We can also take temporary action by making sure all of these spots are repaired, prior to making the decision for a full blown restoration project. One area of each metal roof thats a potential weak spot is the edge of each metal sheet that was previously installed. High winds can force heavy rain to wick up underneath the sheets, allowing the moisture to go straight into your building. There’s a sealant that is applied between these sheets during the original installation that is supposed to prevent this. This sealant will break down and decay as it gets older, which will let the moisture through. 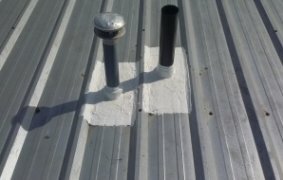 Our system works well due to the unique process we employ while restoring a commercial metal roof. First, we find and rectify all rusty spots and leaking areas. Then unlike a lot of other contractors that just cover up the issues with just a superficial finish, we apply our high-tensile quality coating. First Step – Priming. A rust resistant primer is applied to neutralize the rusting spots. This prohibits rusting areas from causing more issues as time goes by. Second Step – Caulking. All of the most likely spots for leaks, the fastener heads and screws, are caulked to prevent any water from seeping through them. An added layer of protection agains leaking for your building. Third Step – Treat the Seams. We use solid fabrics or butyl tape between the layers of the base coat for the seams. Fourth Step – The Coating. The last step is applying the reflective and durable finishing coat. This will protect it from extreme weather elements, reflect the suns rays from the building and keep more leaks from appearing. This will add years and years of protection and lifespan to your commercial metal roof. The issues you’re having were probably caused by having an inferior product installed when the metal roof was last installed. Choosing a more durable silicone over acrylic products would be a great place to start. Silicone is a superior product that won’t fade, haze, chalk or degrade over time like acrylic. This makes it a great material for metal roof repair and restoration. They are also more eco-friendly, reducing environmental impact, last longer and have a lower VOC. You should always double check, for comparison purposes, differing products for their Energy Star compliant properties. Improving your building’s insulation, at this time, would be a great idea, as silicone spray foam does a fantastic job of raising the R value by protecting against the elements. Your contractor should have several different silicone products they can recommend to you. 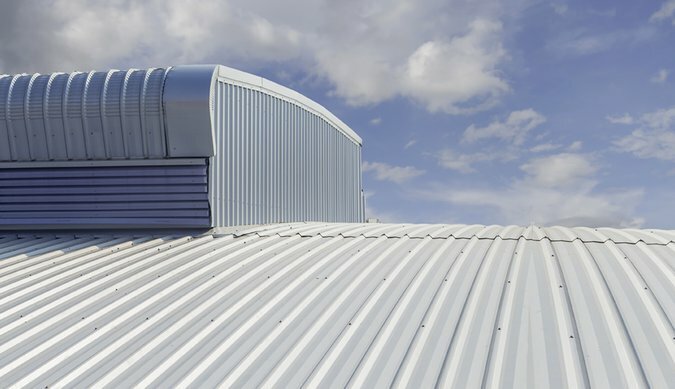 Each metal roofing system has its own unique qualities and features. We make sure that we keep on top of the entire project and process from start to finish, monitoring every project to make sure your buildings individual features are enhanced, and always working to improve our processes and product choices. Taurus Elite Commercial Roof Systems, 512-332-4422, provides commercial roofing services to Austin, Texas and the surrounding area. This includes commercial metal roof repair, commercial metal roof restoration, commercial metal roof replacement and commercial metal roof installation. We have been providing professional commercial roofing services to the area for over 20 years. When you need an experienced, honest metal roof restoration contractor to help you make the right decision, give us a call.